With summer around the corner, I am focused on getting thin and staying hydrated. I figure that I can help my friends do the same by bringing this healthy low-calorie watermelon salad to pot luck gatherings. There is always a reason to eat a salad. Maybe you are trying to watch your calorie intake. Or maybe you just want to eat more fresh fruits and veggies. Whatever your reason, my watermelon salad is the answer you were looking for. One bite tastes like summertime! It’s so hydrating and sweet without any extra sugar. I added sprigs of fresh mint to the salad too. The fresh mint really enhances the natural sweetness of the watermelon. And don’t forget the feta cheese! It has to be feta. It has just enough earthy flavors to round out the salad and balance it. How to Make Watermelon Salad Recipe? Mix together 1 tsp salt, 3 tbsp red vinegar, and 1 tbsp lime juice until the salt is disolved. I put the mix in the microwave for 10 seconds to move it along. Whisk together the vinegar mixture and 1/3 cup olive oil. Juice fresh Jalapeno and whisk into vinegar mixture. Slice the watermelon into small bite size pieces. 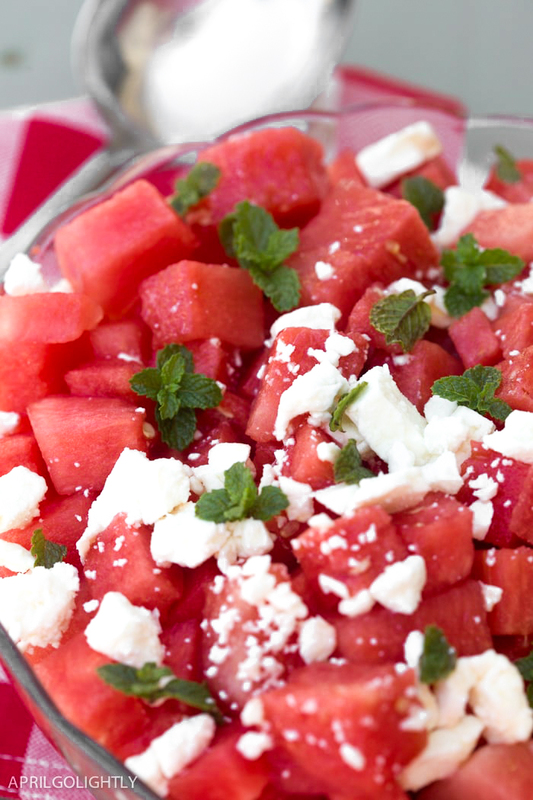 To sufficiently mix the salad together, layer the watermelon, vinegar mixture, feta cheese crumbles, and mint leaves at least twice in a large bowl. What is the best dressing for a watermelon salad? I used a tangy combination of vinegar, lime juice, and olive oil. I discovered that this created the most amazing flavors with the sweet watermelon and bright mint. I wouldn’t use any creamy dressings. The cream won’t mix well with the fruit. You should store this salad in an airtight container in the refrigerator. It will only last a few days though, so eat it up! What Other Fruits Can You Add? Try adding these fruits to the watermelon salad for a really colorful and healthy side dish. When are Watermelons in Season? Watermelons are typically in season from May to September. That’s why this is such a popular salad for summer parties like cookouts and BBQs. What do you serve with Watermelon Salad? Since this is a fabulous cookout salad, you can serve it with all your favorite meat or meatless main dishes. Soft Pretzel Bites – these are pretzels wrapped around mini hot dogs. Chicken Kabobs – these have a homemade Tzatziki sauce. Mix together 1 tsp salt, 3 tbsp red vinegar, and 1 tbsp lime juice until the salt is disolved. Put the mix in the microwave for 10 seconds to move it along. Dice and seed fresh Jalapeno. Whisk the jalapeno into vinegar mixture. My girls would live off this, if they could! They love watermelon! This is one of my favorite salads. [email protected] Busy and Hungry! So pretty! And a great combination of flavors. Perfect for any summer gathering! What a lovely salad! So refreshing and healthy…I’m for anything that incorporates my bumper crop of mint! I love watermelon SO much and this salad just looks heavenly! Thanks for linking up with Delicious Dishes Recipe Party! Watermelon isnt listed as an ingredient, what idiot wrote this? This watermelon salad should be very easy to make, it’s perfect for the summer I loved the hint. How in thre world do.you juice a jalepeño? This is the best combination of flavors. SO YUM!